I took Jasper for a walk yesterday and had a chat with the owner of a bouncy retriever/sheepdog mix while Jasper played with the dog. We commented on how nice the weather was and I then said, “Coming out now was a good idea because it is supposed to rain later.” We both then had a good laugh because we realized that ‘supposed to rain later’ has been the forecast for every single day this summer so far. We then went out to visit friends at their small hobby farm. They have a little girl, T, who is coming up on two years old and is exactly half the size Boo is. Boo is not only our youngest child and the youngest of all the cousins, but the smallest kid in her class last year. I’m used to thinking of her as little. Suddenly, she looked large and dirty and sweaty. She wasn’t actually dirty. She is just tanned and covered in scratches and healing wounds. Anyone with more than one child will know exactly what I mean when I describe this sudden transformation, because when you have child #2, it happens to child #1 the moment you see your eldest after the birth. Your sweet little kid is suddenly a huge, scabby lummox. But Boo never had a younger sibling and most of our friends are post-baby too. And usually when we see these friends, the older kids are around to provide perspective. This time, it was just the two of them. Speaking of large, dirty and scabby, we picked Asher up from camp today. Because it is his first year, he only goes for half a session. It was nice, getting to pick him up, because I got to see Maya and also look around the camp, which I only saw years ago when J dragged me there for some reason. I was surprised, when we went into Asher’s cabin, to find him packed and announcing he’d lost nothing. Asher loses stuff between his bedroom and the bathroom (as do I), so I found this difficult to believe. But I poked around the cabin, rooted through the lost and found and generally kept my eyes peeled and found nothing of his. When we got home and I began to unpack his duffle bag, I realized that this miracle had less to do with any remarkable transformation on Asher’s part and more to do with the fact that he appears to have simply worn pretty much the same thing every day, leaving the rest of his clothes untouched in the bag. He claims this isn’t so, that he simply folded his clothes again, but those of you who have ever had nine-year-old boys can see the absurdity of this story. He did confess to having only showered twice and unpacking his toiletry bag revealed that those showers did not involve soap or shampoo. So I put him in the tub this evening for a good soak and then scrubbed him. I felt like I was reclaiming him from the wild and reasserting my momminess. Maya, on the other hand, was fresh as a daisy when we saw her, because she’s been showering daily. And brushing her teeth. What is it about girls that they civilize so much more quickly than boys? Her cabin was crammed with girls and yet they each had their stuff piled on separate shelves and nothing on the floor. A visit to her cousin’s cabin was made difficult by the fact that there was no floor to walk on – it was carpeted with abandoned clothing. Both cousins were shirtless during our visit and since it wasn’t particularly hot or sunny, I suspect they were simply unable to find a shirt to wear. The boy came home with a new toy to play with – his uncle had sent a guitar to camp for Asher with the cousins. Up at the cottage, Asher became obsessed with my BIL’s little guitar. 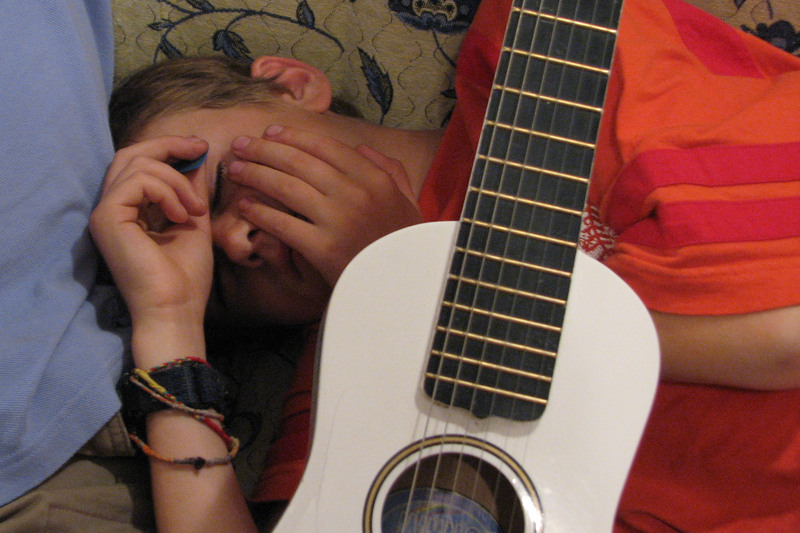 Here is a photo of him from our vacation, having fallen asleep playing it. Note the pick still in hand. His new one is a cool red.